What if my InfoVue output is HD and my cable channel is SD? 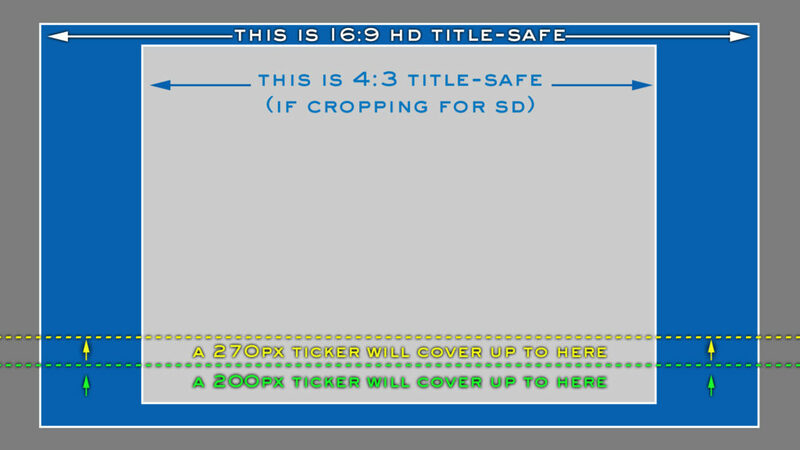 Even if you are running InfoVue to an SD channel for cable, it is recommended that you design your InfoVue display for HD, and set the downstream equipment to either letterbox or crop that signal to SD. If letterboxing, this is handled in the HyperCaster’s internal or external ProVue encoder. If cropping, for that to display properly, you need to design your HD InfoVue TICKERS and TEMPLATES so that they can be cropped at the sides without losing any content. You also need to adjust certain settings in your downstream equipment. Copy/Paste that template from the InfoVue Library into your own InfoVue organization. From the lower left, choose Background → Image, and scroll down until you see the guide. Double-click on the guide thumbnail to make it the (temporary) background of your template. Design within the “4:3 title-safe” boundaries. When you are satisfied with your design, you can replace the background with whatever you want: Color, or another Image of your choice. Since background images are not available in the ticker designer, you can create a (temporary) shape to help you keep your content within boundaries. Confine your content to those dimensions, and they will display in SD Crop Mode. You can always include your Shape in the final design if you like, or delete it after all content has been placed. Save, and put this ticker in the Published folder, or attach it to a Playlist. Set the encoder input and output to SD (to avoid distortion). Can I use animated gif or transparent png in InfoVue? How do I hide the Audio zone in my InfoVue template?